It seems everyday becomes increasingly more difficult for companies to reach out and find their target audience. In this multi-device, always-connected world, consumers are distracted and more fragmented than ever before. There seems to be new ways to try to combat this challenge of disengagement through various channels like mobile, social, geofencing, programmatic, content marketing, native advertising (pick a buzzword), but the fact remains that the audiences we are trying to reach are inattentive and harder to locate. On top of all these new additions to our marketing mix, mass media is no longer an easy way to reach a given audience. People are watching TV less and less and not listening to conventional radio stations. The new “broadcast networks” are Facebook, Twitter, LinkedIn and Snapchat. Just like their predecessors, these channels are not set up with a selfless goal in mind. Gone are the days of creating a social presence, like a Facebook Business Page, and watching the traffic roll in. “Pay to Play” has already become a reality for marketers and it’s certainly easy to understand why some just throw their arms up and say enough is enough. The mobile revolution has already happened. Your target audience is still out there, checking their email, browsing through apps, searching for what they need in the moment, whether they are walking down the street, riding in a car, or just sitting at their desk with five minutes to spare. Our challenge as marketers in this complex ecosystem is to be able to know who these potential customers are, where to find them and on what devices. So as we continue to strive for new ways to find our target audiences, one question that repeatedly arises is “When should I invest in Display advertising?” Over the years, The Xcite Group has had many clients that have put money into Display before they were ready, and this often leads to a misconception of the benefits of Display Advertising and ultimately failed campaigns. The nature of Display is about building awareness for your brand and increasing top-of-funnel interest. It is not a direct lead generator and therefore will not perform in the same way as your Search campaigns. So this bodes the question, how do I tell if it’s time to invest in Display? Your marketing isn’t about creating demand, it’s simply about capturing it. 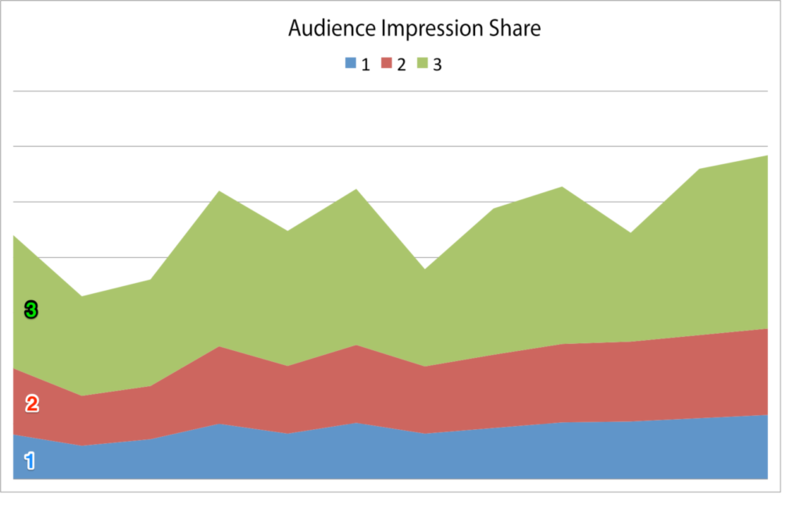 So let’s look at an Audience Impression Share chart and break down how to know if it’s time to invest in Display. The chart represents the various stages of capturing this demand. The blue area represents an advertiser’s current impression share. The red area represents the total available search queries for that advertiser. The green area represents the increase in impressions by adding Display advertising to find new audiences. The biggest mistake we see is when an advertiser starts Display advertising before they have maximized their full potential in their Search campaigns. Although Display advertising may not experience the almost immediate return that Search can offer, it doesn’t mean that it can’t be a very effective tool in finding your target audience. Its role is different. Display advertising makes your Search advertising more effective and scalable by increasing awareness of your company, achieving top-of-funnel interest and ultimately creating more demand. Let’s breakdown the graph to understand how Display advertising can help scale up your existing Search efforts and the role it plays in creating more demand. Stage 1 – the area on the graph represented in blue, is an advertiser’s current state. If you look at the blue in comparison to the red area, you can see that there is more demand available (impression share) then the advertiser is capturing. The reason for this could be limited budget or poor campaign structure. Stage 2 – the area in red is an advertiser who is maximizing their Search campaigns and capturing all available impression share. At this point, advertisers typically are asking how they can generate more traffic and more leads? This is also the point at which throwing more money at Search will likely yield diminishing returns as a result of Search impression shares being maxed out. Unless you add new products or services to your campaigns or increase your geography, more money isn’t going to bring more results in search. We have maxed out our effectiveness with our Search audience and we need to uncover a new audience. This is the time to start looking to Display for additional ways to grow. Adding in Display at this point will help with brand lift and increase the effectiveness of your Search campaigns, as well as fuel demand for all of your different digital channels. Stage 3 – the green area on the graph, is showing where Display comes in. There is an increase in queries and Display is helping to build more awareness for your company and getting your message to more of your audience. The important thing to remember is to weigh your expectations. Display WILL help drive incremental growth to all of your digital efforts, but it doesn’t perform the same way that Search does. As John F. Kennedy said, “A rising tide lifts all boats”, and Display is the lift in tide you could be looking for.